Home » Articles » ICLEI » Kick ICLEI Out! A group from Spokane, Washington called the Spokane Patriots will issue a demand that the city council withdraw from “Sustainability” policy and terminate the city’s contract with the international Non-Governmental Organization called ICLEI (the International Council for Local Environmental Initiatives). ICLEI works in over 600 U.S. communities and 1,000 communities worldwide. The Spokane group presents a city charter amendment along with an ordinance asserting the unconstitutional alliance between the City and ICLEI. SPOKANE, WASHINGTON……Members of Spokane Patriots, the action driven Tea Party, will be filing several citizens’ initiatives with the Spokane City Clerk at 4:00 PM, Thursday, 8 April. The first citizens’ initiative would effect a charter amendment regarding preventing the city from implementing aspects of the Mayor’s sustainability task force by preventing the city from adopting any regulations, taxation, or other policies which would be targeted specifically towards modifying greenhouse gas emissions. The second citizens’ initiative would effect a charter amendment relating to preventing membership in and relationships with the International Council for Local Environmental Initiatives (ICLEI), the United Nations, and other organizations undermining United States Sovereignty. “Spokane Patriots and many others in the city of Spokane are ready to hit the streets for an all out signature gathering effort if needed,” she added. For additional information, please contact Meg Doherty at 509-570-4029. An ordinance relating to preventing membership in and relationships with the International Council for Local Environmental Initiatives (ICLEI), the United Nations, and other organizations undermining United States Sovereignty; amending the Charter of the City of Spokane adopting a new section 34.5, repealing conflicting sections of the Spokane Municipal code, adopting a new section 01.04.035 to title 1 of the Spokane Municpal Code, and providing severability. WHEREAS, in the name of “sustainable development” as documented under United Nations Agenda 21, property rights are often arbitrarily stripped of citizens in the pursuit of a public policy that provides the community little to no tangible benefits. 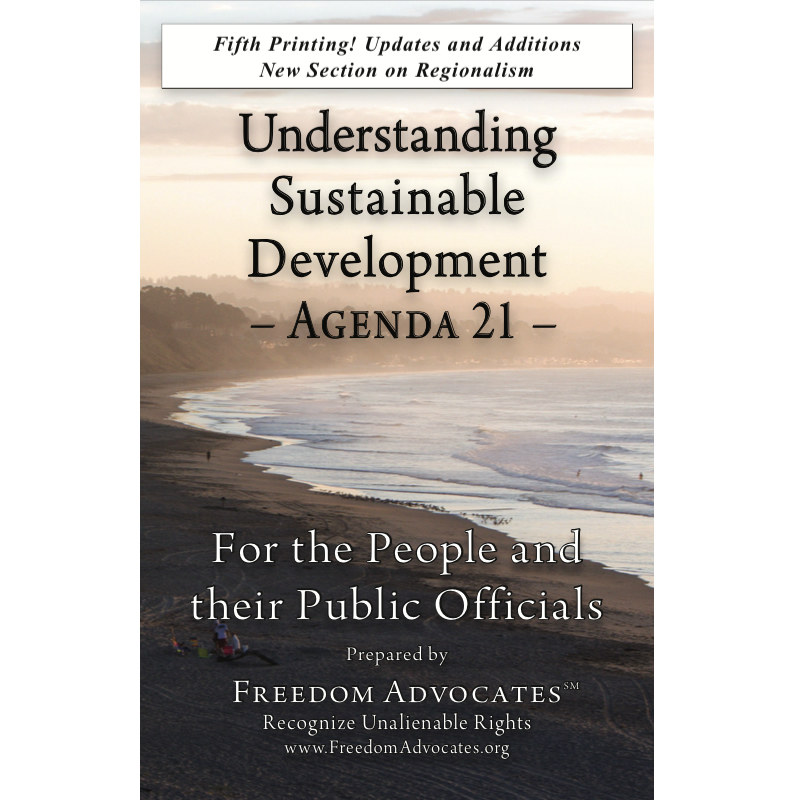 Under the guise of environmentalism, Agenda 21 is a subtle attempt to gradually take away the freedoms and liberties of ordinary Americans, restricting them to urban centers where they can be more readily controlled by a strong statist government. At the same time, through Agenda 21 implementation and the associated Wildlands Project, people are gradually banned from large patches of rural environment where they would more readily be able to escape the increasingly Orwellian control structure of the government. Many of the principles represented in Agenda 21 were recently promoted in the City of Spokane by Envision Spokane via an initiative labeled a “Community Bill of Rights” which would give rights to inanimate objects and restrict the liberties of individual business owners and property owners. WHEREAS, Article I, Section 10 of the United States Constitution makes it illegal for any state or local official to enter any “Treaty, Alliance, or Confederation.” ICLEI’s mandate is to “to build an active and committed municipal membership of local spheres of government (local and regional governments and authorities) as well as international, regional, national and sub-national local government associations.” Thus, membership in ICLEI serves as an unconstitutional alliance under Article I, Section 10 of the United States Constitution. WHEREAS, Benjamin Franklin stated that “Democracy is two wolves and a lamb voting on what to have for lunch. Liberty is a well-armed lamb contesting the vote.” Unfortunately, ICLEI’s charter states that it asks members to “build democratic societies” based on tyranny by the majority and not rule of natural law. This directly conflicts with Article IV, Section 4 of the United States Constitution, which states: “The United States shall guarantee to every State in this Union a Republican form of Government.” The clear language set forth in the ICLEI statement of principles place emphasis not upon the rights of individuals, but a controlled, centrally planned society to equalize outcomes in order to promote human development in “an equitable and sustainable manner.” The principles of such political philosophy were best codified by Karl Marx. Neither the City of Spokane, nor any agency or corporation created by the City of Spokane, can be a member of, receive funding from, contract for services from, or give financial or other forms of aid to the International Council for Local Environmental Initiatives (ICLEI), the International Democratic Union (IDU), the United Nations, any entity established by the United Nations, or any entity whose purpose is to undermine the sovereignty of the United States and restrict the natural rights of the people of the United States as elucidated by the founders of this nation. Section 2. That all ordinances, resolutions, motions or orders in conflict with the City Charter amendment specified in Section 1 are hereby repealed to the extent of such conflict. A. Neither the City of Spokane, nor any agency or corporation created by the City of Spokane, can be a member of, receive funding from, contract for services from, or give financial or other forms of aid to the International Council for Local Environmental Initiatives (ICLEI), the International Democratic Union (IDU), the United Nations, any entity established by the United Nations, or any entity whose purpose is to undermine the sovereignty of the United States and restrict the natural rights of the people of the United States as elucidated by the founders of this nation. B. If the mayor of City of Spokane has not terminated its membership in an organization specified in subsection (A) of this section within thirty days of the effective date of this ordinance, the mayor shall be fined $1,000 for each day the City is still a member of such organization payable to the City of Spokane. C. If one or more city official accepts funding or services from, or provides funding or resources to an organization as specified by subsection (A) of this section, such officials shall be personally liable to the City of Spokane for the amount of money either accepted or contributed, unless the direct transfer of money is not involved, in which case the person shall be liable for the amount of money equivalent to the fair market value of all services or resources given or received in violation of subsection (A). D. All officials participating in violations pursuant to this section shall be jointly liable to the City of Spokane for such actions. E. The City of Spokane shall not indemnify any public official of any liability incurred pursuant to violations of this section. F. Either the Washington state attorney general or the county prosecutor can initiate civil suits against a public official for violations pursuant to this section and can also seek a writ of mandamus to terminate activities described in subsection (A) of this section. Proceeds from the lawsuit in excess of reasonable litigation costs shall be deposited into the general fund of the City of Spokane. G. Violations of this section shall constitute valid cause for removal from office pursuant to SMC 01.04.065. Section 4. That this ordinance be submitted to the electorate of the City of Spokane for their approval or rejection at the next election applicable under Section 82 of the Charter of the City of Spokane. Section 5. Severability. If a part of this act is invalid, all valid parts that are severable from the invalid part remain in effect. If a part of this act is invalid in one or more of its applications, the part remains in effect in all valid applications that are severable from the invalid applications. Section 6. Effective Date. This ordinance, if approved by the electorate, shall take effect and be in full force upon the issuance of the certification of election by the Spokane County Auditor’s Office. An ordinance regarding preventing the city from implementing aspects of the Mayor’s sustainability task force by preventing the city from adopting any regulations, taxation, or other policies which would be targeted specifically towards modifying greenhouse gas emissions; amending section 37 and providing a new section 120 to the City Charter, repealing conflicting ordinances, adopting a new section 01.04.037 to the Spokane Municipal Code, and providing severability. WHEREAS, carbon dioxide is a natural byproduct of life and a necessary component of the atmosphere to sustain healthy plant life. This molecule is not a toxin or carcinogen. Carbon dioxide has existed at much higher concentrations than currently present in our atmosphere such as during the Mesozoic Era when the dinosaurs roamed the earth and animal and plant life were extremely abundant. There is substantial evidence that climate change is primarily due to the natural solar cycle. In the recent time period climate change activists claim the earth was warming due to carbon dioxide emissions, other planets in the solar system were undergoing global warming simultaneously without man made carbon dioxide emissions being present. Geophysical Research Letters published a paper in 2005 which showed that arctic temperatures in the twentieth century were closely correlated to solar activity and not to atmospheric carbon dioxide concentrations. Moreover, there are multiple lines of corroborating evidence demonstrating a roughly 1,500 year cycle (plus or minus 500 years) of warming going back 400,000 years. Temperatures in the Medieval Warm Period (1100 to 1300 AD) were higher than at present, despite not having experienced the Industrial Revolution. Throughout history these warm periods have proved to be beneficial to society, particularly with regards to agricultural production. Many of the predictions of the man made global warming hypothesis have been contradicted by empirical evidence. These include (1) the lack of additional water vapor being trapped in the upper atmosphere, (2) surface temperatures increasing at a faster rate than those of the upper atmosphere, a trend that should be reversed as predicted by the greenhouse gas hypothesis, (3) warming is not the strongest in the polar regions of the Earth as predicted by greenhouse gas models, (4) carbon dioxide has been shown to be a lagging, not leading, indicator of global warming throughout the history of the earth (most likely due to changes in solubility of carbon dioxide in oceans as temperatures rise), and (5) mean temperatures declined from 1940 to 1975 despite huge increases of man made carbon dioxide during this period. WHEREAS, taxpayers should not be forced to subsidize costly policy decisions based on junk science and the erroneous proposition that carbon dioxide is harmful to our environment. Revenues lost on funding incentives for promoting an anti-carbon dioxide agenda necessarily need to be repaid by the remainder of the taxpayers. Preferential parking access for uncommonly used vehicles can create a parking availability issue for citizens utilizing vehicles that are not favored by the city. Carbon dioxide is a harmless gas that is often released in industrial production. Any effort to artificially limit its production could thus provide permanent damage to the city’s local economy and tax base. Finding alternative sources of energy as a means of lowering the long term cost of providing city services is a laudable goal, this should be the only goal of such efforts. The use of alternative sources of energy that are substantially more expensive than existing technologies should not be justified in the name of the junk science of global warming and such usage would be violating the fiduciary responsibility city officials owe to the taxpayer. Subject to the general laws of the State of Washington, the city council shall by ordinance regulate the manner in which the City contracts for public works, personal services, and the acquisition and disposition of property. The city council shall employ accepted procurement principles, reserving in all cases the right to reject all bids, proposals, or other offers, and, as trustee of public funds, shall in all procurements of public works, goods, and services promote the public interest. City officials and employees owe a fiduciary duty to the citizens of the city in the management of the public funds. All expenditures shall be made while being mindful of the lowest long term cost to the taxpayer over the life of the project without regards to ancillary criterion such as greenhouse gas emissions. In evaluating the long term financial costs of purchase decisions, city officials and employees shall only use assumptions on the cost of future materials, resource, and fuel acquisitions that are consistent with the assumptions made in the long term city budget. City officials and employees may not violate low bid provisions of state law even if granted a waiver by the state except that such action should be explicitly authorized by a vote of the people. a. No public funds can be used to educate, indoctrinate, advertise, or imply the idea that carbon dioxide, water vapor, or other nontoxic greenhouse gases are harmful to the environment, that these gases need to be intentionally reduced, or that mankind is responsible for climate change. The city shall not fund incentives or impose mandates specifically purposed towards lowering carbon dioxide emissions, nontoxic greenhouse gas emissions, or the carbon footprint of the city as a whole. b. Vehicles shall not be granted preferential access to parking spaces based on the gas mileage of the vehicle, the type of engine used by the vehicle, or the type of fuel consumed by the vehicle. c. The government cannot spend excess money on any project to specifically reduce carbon dioxide emissions, nontoxic greenhouse gas emissions, or the city’s carbon footprint above and beyond what is necessary to accomplish the same project absent the aforementioned goals. The government shall seek to use those energy sources which provide the least long term financial burden on the taxpayer based on fuel price assumptions consistent with the existing city budget. d. Evaluations and remuneration of city employees or officials shall be made independent of any evaluation of their ability to manage the City’s carbon footprint or greenhouse gas emissions. Section 3. That all ordinances, resolutions, motions or orders in conflict with the amendments to the City Charter specified in Sections 1 and 2 of this ordinance are hereby repealed to the extent of such conflict. A. Definitions. The definitions in this subsection apply throughout this section unless the context clearly requires otherwise. 1. “Greenhouse gas” includes carbon dioxide, water vapor, methane, nitrous oxide, sulfur hexaflouride, hydrofluorocarbon, or perfluorocarbon. 2. “Nontoxic greenhouse gas” includes carbon dioxide, water vapor, and any other greenhouse gas that is not classified as a “toxic greenhouse gas” under this section. 3. “Penalties or fines” means any civil or criminal penalty or fine, tax, salary, wage withholding, surcharge, or any named fee with a similar effect that is established by law, rule, or regulation by a government-established, created, or controlled agency that is used to punish or discourage the exercise of rights protected under this chapter. 4. “Toxic greenhouse gas” means any greenhouse gas that multiple confirmatory scientific studies have proven beyond a reasonable doubt is directly toxic to life under normal circumstances and at naturally occurring concentrations. 7. Expend any resources under the City of Spokane’s disposal, including public funds, to modify nontoxic greenhouse gas emissions indirectly through public education efforts. Prohibited activities include: Advertising that carbon dioxide and other nontoxic greenhouse gases need to be reduced; Advertising that nontoxic greenhouse gases are harmful to individuals or the environment; Sponsoring propaganda campaigns in public schools designed to convince students that nontoxic greenhouse gas emissions are responsible for climate change; and Implementing any other public education efforts designed to limit nontoxic greenhouse gases. C. If one or more city official participates in enacting or enforcing a public policy that violates the terms of this section, such officials shall be liable to the City of Spokane for an amount of between $1,000 and $10,000 per violation. All officials participating in violations pursuant to this section shall be jointly liable to the City of Spokane for such actions. The City of Spokane shall not indemnify any public official of any liability incurred pursuant to violations of this section. D. Either the Washington state attorney general or the county prosecutor can initiate civil suits against a public official for violations pursuant to this section and can also seek a writ of mandamus to terminate activities described in subsection (B) of this section. Proceeds from the lawsuit in excess of reasonable litigation costs shall be deposited into the general fund of the City of Spokane. Section 5. That this ordinance be submitted to the electorate of the City of Spokane for their approval or rejection at the next election applicable under Section 82 of the Charter of the City of Spokane. Section 6. Severability. If any provision of this act or its application to any person or circumstance is held invalid, the remainder of the act or the application of the provision to other persons or circumstances is not affected. Section 7. Effective Date. This ordinance, if approved by the electorate, shall take effect and be in full force upon the issuance of the certification of election by the Spokane County Auditor’s Office.